Kateri making her First Communion at All Saints parish in Albany. When her fourth daughter was born missing the center of her heart, Jeanie Reedy turned to Blessed Kateri Tekakwitha for a miracle. She acquired a relic of the Mohawk maiden, one of her favorite Catholic figures, and prayed for the success of her baby's open-heart surgery. "It's hard to hand this tiny little person over to a surgeon," Mrs. Reedy said. Christened Kateri (which her family pronounces KATE-er-ree), the little girl came through her surgery well. On the day little Kateri came home from the hospital, speculation about Blessed Kateri's sainthood cause was announced in the media. Kateri Reedy is now eight years old. She recently made her first reconciliation and communion at All Saints parish in Albany. Her family has continued to follow news about Blessed Kateri, making pilgrimages at least once a year to the future saint's birthplace in Auriesville and to St. Francis Chapel in Colonie, which has a small shrine to Blessed Kateri. Last month, the Reedys visited Fonda, location of the National Shrine of Blessed Kateri Tekakwitha. Prayer cards with Blessed Kateri's image are placed throughout the Reedy home, and Mrs. Reedy stays informed about the future saint through a Facebook group. She remembers celebrating the Vatican's decision last winter: "We were so excited." Mrs. Reedy believes Blessed Kateri has continued to watch over her Kateri, who has Down syndrome. Kateri uses sign language and computerized devices to communicate and didn't walk until age four. Mrs. Reedy said the family feels "like there's an angel on her shoulder." This fall, Kateri will be a third-grader in a class for students with special needs at Altamont Elementary School. Her mother says she's "fiery," like the saint she's named for: "It's hard to get anything by her." In fact, young Kateri refused to continue sitting in a pew when her family received communion, so the parish found a sacramental preparation kit Mrs. Reedy could use at home. 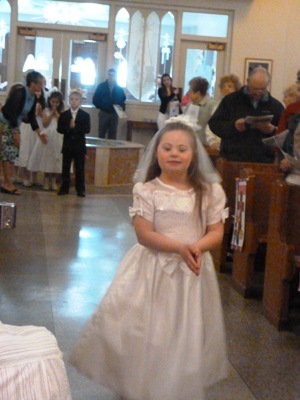 "She was just one of the kids," Mrs. Reedy said of her daughter's First Communion. Another First Communicant helped Kateri walk up to the altar. Mrs. Reedy, whose third child also has Down syndrome, said it's a blessing to see how people react to her children: "It's wonderful to see people love them back the way you love them. We really do feel very blessed with Kate."